As part of our new digitally-led US project States of Independence we've invited our favourite 30 American curators, magazines, creatives and institutions to takeover Dazed for a day. It only seemed right to hit up New York's art 'it girl' Petra Collins for an insider take on US creativity right now. In this five-part series, Petra Selects, the prolific photographer shoots and interviews her favourite underground creatives set to steal the scene stateside. 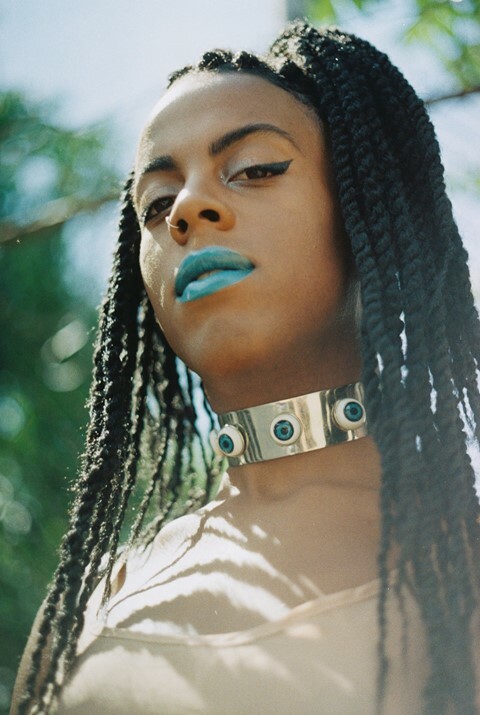 Juliana Huxtable, the former legal assistant turned artist and DJ at SHOCK VALUE (the infamous weekly club night which she founded,) is like nothing you've ever experienced before. A prominent member of the LGBT activism community, Huxtable and the art collective she runs with, House of LaDosha, once referred to as a "Queer Coven", are blurring the gender boundaries across fashion and art (earlier this year she walked for DKNY in their AW14 show). We caught up with Juliana about the explosive NYC club scene and why the media have failed queer rap. What’s the vision behind your night, Shock Value? You’ve described it as a “nightlife gender project”? Juliana Huxtable: I just wanted to create a space where all of the ideas I had of the world, and the community of people who inspired them here in New York could come together. Why are so many gay male spaces hostile to lesbians? Why are so many of the raves in Bushwick filled with bros who are dancing to vogue beats but there's three black queens in the room? Where was the nightlife run by women, cis, trans or otherwise? I just wanted a space where all of my friends could come together, where girls where in charge, where all of my trans friends could come without dealing with the anxiety that comes with many spaces. I discovered that when thats the goal, the natural diversity and vibe that comes as a product is amazing. I remember one night when some gross dude came in and was feeling up on girls at the party – without needing external security a group of my female friends all got together and escorted him out onto the street. Thats a dream come true to me. There were all sorts of other types that came too. It was really beautiful to me and I know a lot of other people felt the same way. Juliana Huxtable: I'm not sure about an overall trend, but the internet and specifically social media, became an essential way for me to explore inclinations that I otherwise would not have an outlet for. Some people go to school for painting or sculpture or new media and have the education and training to explore artistic venues. I didn't. I was always intimidated by the idea of being entitled to create. I second guessed myself and when I did try to explore classes when I was in school at Bard, I was often met with dismissive comments about my inability to escape 'identity'. What I found online were communities of people, both encouraging and critical that were open to engaging with work, no matter how minuscule or developed in scale, and from that I developed a set of practices and an audience that I continue to develop. For me its also engendered a sense of experimentation and play in regards to creating that many people lose touch with. I guess all the things i create are sort of like the range of media I might come across on my tumblr dashboard, which has been on of my primary sources of inspiration. Who in the digital community inspires you in the US – do you have an Internet muse you've never met? Juliana Huxtable: Theres so many of them, I could never list them all here. My biggest inspirations are my friends here in NYC. The creative energy and #sisterhooding that's happening is so HAM. If I need inspiration, I can just look around and theres so much of it. Queer rap is coming alive in NYC, with openly out or trans hip hop artists gaining more exposure than ever before: Mykki Blanco, Cakes da Killa, Zebra Katz. Perhaps where there was worry that hip-hop would shut out queer rappers, now there is a concern audiences will pigeonhole them, or pit them against each other. What do you think? Juliana Huxtable: I'm excited to see so many of these rappers, most of whom are my peers or friends, be successful and most of them deserve the coverage that they're getting. Unfortunately, the media coverage of 'queer rap' has largely been a failure in my opinion. While these artists are indeed queer, most if not all are gay males from New York City. The scene(s) that many of these rappers participated in included women and even gay rappers from other regions that have been making 'queer rap' far before many of the men given credit now. Yo! Majesty, Sgt. Sass, Benni E, Black Cracker, Bunny Michael, OMG Michelle, Gravy Train, Quay Dash, the long and extensive list of Stud Battle rappers. I could go on an on, but my point is that its a bit disappointing to me that so many of the people vital to the idea of queer rap are not included at the moment when the public is forming its idea of what a canon of this genre includes. How long do you think you'll run SHOCK VALUE – what are your ambitions for the project, or for any others in the future? Juliana Huxtable: The weekly party is on hiatus right now while I find a new venue and work through some of the logistical kinks, although I'll continue to throw one-offs in the interim. I'll throw SHOCK VALUE as long as I'm in nightlife to some degree, which I envision will be for a hot minute lol. I love nightlife – its a source of inspiration and community and I wouldn't be who or where I am today without it. Stay tuned for updates about #shocvkvaluenyc cuz when we pop back out its gonna be crunk.